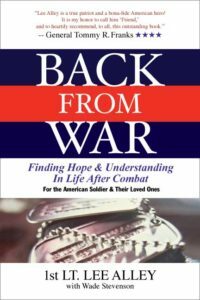 Back From War: Finding Hope & Understanding In Life After Combat is the harrowing narrative of 1LT Lee Alley and his year in the horrors of combat in the Mekong Delta of Vietnam from 1967 to 1968 and his reflections on the years since. Additionally, it is the true accounts of 23 other contributors, their time at war and stories of their return home. All of them discuss feelings of maladjustment, loneliness, depression, bouts of PTSD and negative family repercussions that are similarly felt by many of our nation’s veterans of foreign wars. Lee Alley’s message is clear: Our soldiers are forever changed and it’s time Americans realize it. As 1st Lt. of Recon Platoon of the 5th/60th 9th Infantry Division in Vietnam, Lee Alley displayed extraordinary courage and valor that earned him a hero’s reputation. Among his honors: Army’s Distinguished Service Cross, Silver Star, Bronze Star, 2 Purple Hearts and a nomination for the Congressional Medal of Honor. Lee has a heart for all veterans and their family experiences. Today, June 5th, marks the national launch of the paperback version of Back From War. Under limited release, the hardcover has proven to be a healing agent for many veterans and members of their families. Combat not only affects the veteran, but also impacts family relationships. Lee Alley’s mission with Back From War is to help veterans and their families deal with the ever-present effects of service. A portion of the proceeds from the sale of this book goes to support the National Military Family Association’s Operation Purple Summer Camps, a free program helping military children of deployed service members.